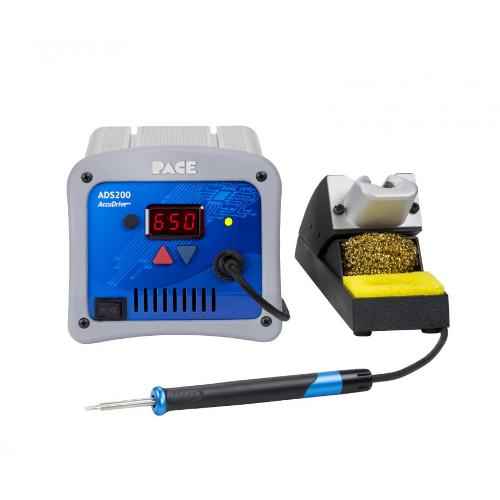 The 8007-0578 is an ESD-Safe ADS200 AccuDrive™ Soldering Station Set. This set includes the ADS200 (120w) Station, TD-200 Solder Iron (6010-0166-P1) and a Standard Tool Stand (6019-0088-P1). The ADS200 Station features a digital LED Display, an all metal construction and has the ability to solder everything from delicate components (0201) to High Mass applications. This station offers a simple operation, Power On, Set Temperature and Start Soldering. The station comes equipped with three (3) user-definable Temperature Pre-sets, which can be easily scrolled through via the "Up/Down" Buttons on the face of the station. The ADS200 AccuDrive™ system provides absolute temperature accuracy, eliminating the need for routine and costly calibration. The 8007-0578 System includes the TD-200 Solder Iron. This iron offers sleek dimensions and a comfortable ergonomic handle, that stays cool for the operators hands, even during extensive use. The TD-200 provides accurate tip temperature, as well as, instant heat-up and recovery. This iron offers high-capacity heating (up to 120w of power) and is designed with an ultra short tip-to-grip [under 1.9" (48mm) L) for precision operator dexterity. The TD-200 is compatible with the AccuDrive™ "Blue Series" Solder Tip Heat Cartridges (1130 & 1131 Series). The included Tool Stand can hold up to 7 tips, comes standard with sponge, stay-moist well and brass wool tip cleaner to clean oxidation from tip.